In early June 1975, Jim was delighted to receive an invitation to be honored by The Sons of The Desert, a Laurel and Hardy appreciation group founded in 1965 by their biographer John McCabe and Stan Laurel himself. Before that, Jim had been honored for specific work, like Sam and Friends, his commercials, and Time Piece, but had not been personally recognized for his entire artistic output. 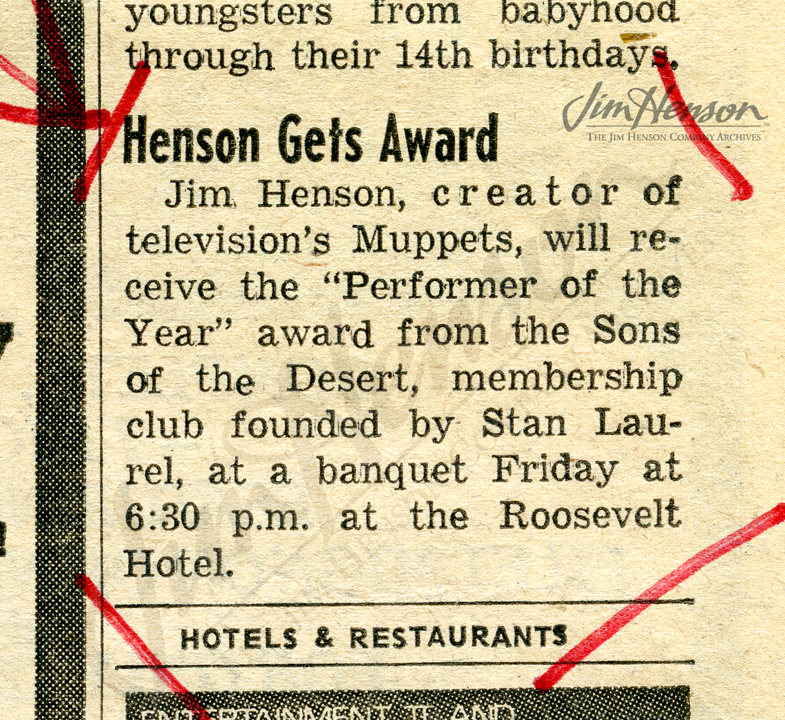 The Sons of the Desert were awarding Jim their “Performer of the Year” award which recognized (according to a letter from their President Tye Morrow), “…the many hours of enjoyment which you and your lovable ‘friends’ have given through your consistent proficient performances and the outstanding contribution you have made to the entertainment industry.” Jim was only the second recipient of this award; the 1974 tribute went to Peter Cook and Dudley Moore. The ceremony was scheduled for June 20th at the Grand Ballroom of the Hotel Roosevelt in New York, and Jim agreed to bring along Kermit. Up on the podium, Jim graciously accepted the award and Kermit made snarky comments about the difficulty of being an amphibian in the desert. While Jim defended the legitimacy of the group (whose mission is to, “…perpetuate the fun and laughter generated by the films of the world-famed comedy team,” according to the press release), he must have reveled in some of their silly customs and traditions. Each chapter is known as a “tent” and is named for a Laurel and Hardy film. The stationery identified the founder as the “Grand Sheik”, and cartoonist (and member) Al Kilgore designed an elaborate crest. Along with a lion and a unicorn, it features a slogan suggested by Stan Laurel, “Two minds without a single thought” translated to Latin as “Duae tabulae rasae in quibus nihil scriptum est”. Some of these types of silly fraternal traditions made their way into Fraggle Rock for the “Secret Society of Poohbahs” episode written by Jerry Juhl. While most of the denizens of the Rock were designed by Michael Frith, Jim took special care to design the Vanguard of the Poohbahs (a costumed Convincing John) himself. See the Vanguard of the Poohbahs in action. The Sons of the Desert logo designed by Al Kilgore. 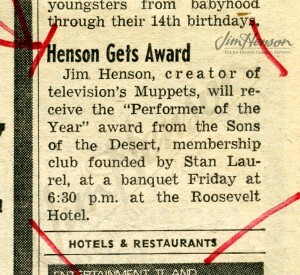 The New York Post announced Jim’s award, 6/17/75. 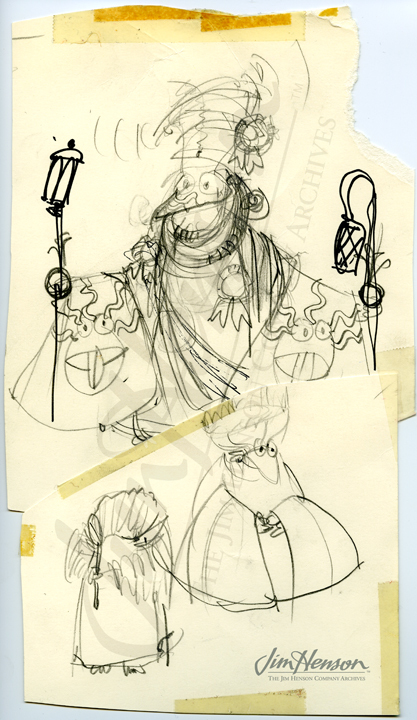 Jim’s design for Convincing John as the Vanguard of the Poohbahs in Fraggle Rock. This entry was posted in 06-June '75, 1975, Honors and tagged Al Kilgore, Dudley Moore, Fraggle Rock, Hotel Roosevelt, Jerry Juhl, John McCabe, Kermit, Laurel and Hardy, Michael Frith, New York, Peter Cook, Sam and Friends, Secret Society of Poohbahs, Stan Laurel, The Sons of The Desert, Time Piece, Tye Morrow. Bookmark the permalink.